Last week was my anniversary. My sweetie and I celebrated 24 years of marriage. But every time we appreciate that number, it’s hard not to remember that that’s only part of it. We started dating in high school, and dated for 5 1/2 years, so by the time we celebrated our 24th anniversary, we’d been together 29 years ~ more than half our lives. That’s a good friendship, ya know? Anyhow, he came home for lunch that day ~ which he always does ~ bringing flowers and a balloon for me ~ which he rarely does. It was a lovely bouquet of red roses, with a ton of baby’s breath and assorted greenery, which was also lovely. 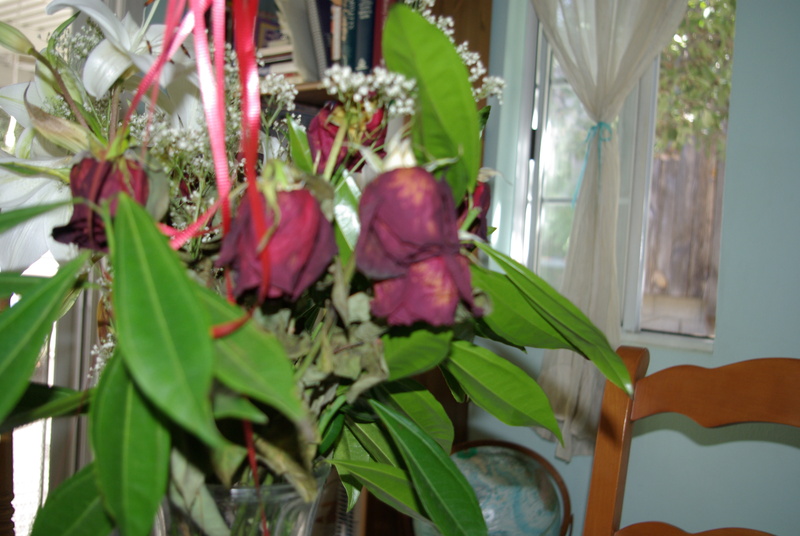 I’ve kept the flowers watered, and added that mysterious powder that comes with flowers these days, but as flowers are wont to do, they have begun to wilt. All those beautiful, sweet-smelling roses are bowing their little heads, and while they’re still pretty, I know they’re not longed for this world. I didn’t even know those lilies were in that bouquet! I guess they were all closed up, and still a light green, and they just blended right in with the profuse greenery. 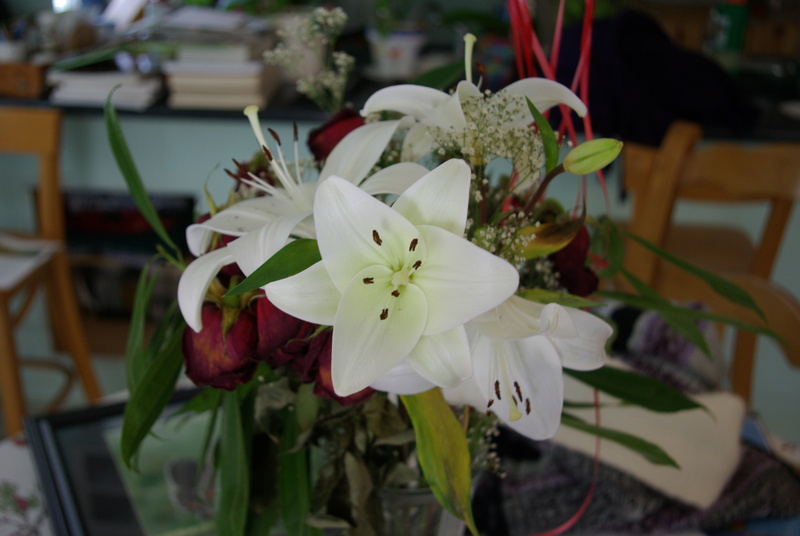 But as I’m losing those roses, the lilies are taking over as the primary beauty in the vase. It’s like a two-part gift! When it’s time for something beautiful to leave your life, God has something else beautiful waiting in the wings.